Theory Hair Studio offers the highest quality hair extensions available with two different methods to choose from, Micro Ring (Individual iTip or Hand Tied) and Invisible Extensions, also known as, Tape Extensions. The safe and easy Micro Ring method is available in a vast range of colors and numerous sizes of width and length. Each set of extensions are custom for each individual’s desired looks, length, thickness, colors, and textures. The luxury of Hair Extensions gives you beauty with no limits. Our hair extension offers clients many possibilities. Can extensions be virtually undetectable? Yes they can. We have experienced and worked with numerous methods and brands of extensions to search and find highest quality extensions and invisible bonding are virtually undetectable to the touch. Beautiful hair is a must on special occasions and many women know how important it is also for their careers. They also know why! The secret of success is often tied to how you appear. 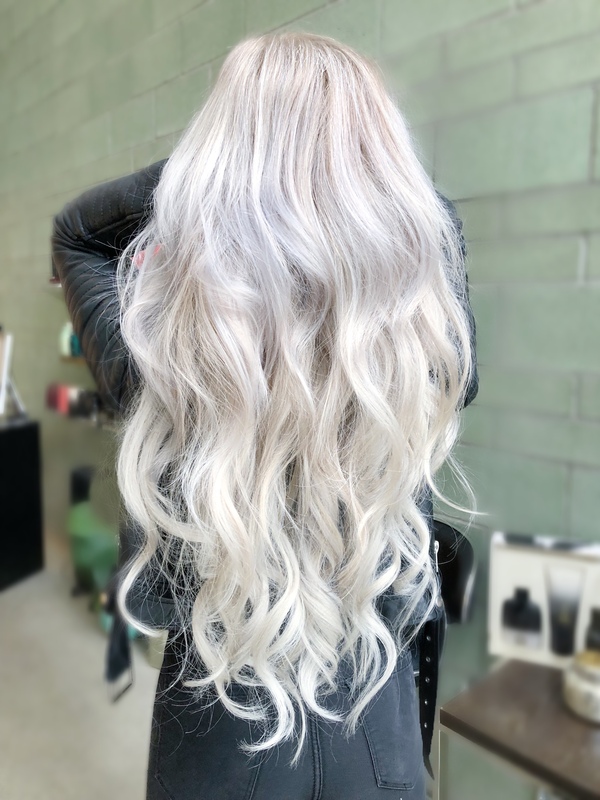 Request a complimentary consultation with our specialist to customize a unique look to you with our two methods, color choices, style, length and thickness. Micro ring hair extensions are a type of hair extensions attached by threading a small sections of natural hair through loops to hold each extension securely in place. They are also known as micro ring hair extensions, copper ring, or HairLocs and they are usually added in row patterns a few millimeter away from the scalp for the most natural appearance. The number and thickness of the micro loop hair extensions depends largely on the thickness and length of the natural hair. One main advantage of these hair extensions is that they are not applied with glues or bonding adhesives that can potentially cause hair breakage or even allergic reactions in some clients. These hair extensions also do not require the use of hot flat irons that can also damage natural strands. The hair is reusable up to a year with proper use and at home care products. This is our most preferred method as it is the least invasive. Should you brush the extensions roughly and creates a slip, that strand does not cause the neighboring extensions to fall. The micro ring are fully customizable with individuals or weft, also known as Hand Tied Hair Extensions. Fast, invisible, and the top quality hair. Invisible Extensions, also known as, Tape Extensions, are the first smart extensions. Invisible/Tape Extensions are applied to your hair quickly, simply and invisibly without any need for heat. Manufactured with high quality human rely hair with the cuticle in tact, allows the hair to be reapplied up to 3 times, while looking and feeling great. 1. Application Individual small beads pressed flat to hold on to the extensions and natural hair at the base. Small wefts about 1 to 2 inches wide with adhesive tape on one side. In general your own hair is “sandwiched” between two strips of tape. 2. Glue or Heat? No glue or no heat is needed to apply the extensions. This is the most clean and easy to release when it it’s time for removal. Adhesive tape. Best to use clarifying shampoo between each application for thorough removal of adhesive. 3. Time of application Depending on the amount of hair and length being applied, in general, an application could take anywhere from 2-3 hours. Approximately an hour of application. 4. How long do I go in between each maintenance? Approximately every 6-8 weeks depending on your hair texture, at home styling, etc. 6-8 weeks. 5. Removal only? Given that you have been taking care of the extensions and maintained every 6-8 weeks, the removal process is $95 an hour and takes approximately 30-45 minutes. We use a tool to reshape the copper ring from flat to round shape and slides the extensions right out. A removing agent is applied to all of the “sandwiched” extensions, some cases, the adhesive will release the hair simultaneously, in other cases, it could be left on for a few minutes while the adhesive weaken. Average time of removal (only) takes about 30-45 minutes and also cost $95 an hour. Brushing: Before washing, thoroughly brush the hair, ideally with a board brush for extensions (ask our extensions specialist). You may also brush your hair after washing and spray it with detangler, brushing the ends first and working your way up to the top of the hair. Washing: When washing, you should only apply a small amount of shampoo on the top of your head and gently massage. Don’t wad hair in a circular motion, as this will cause tangles. Don’t scrub. Most professional salon shampoos are self-cleansing, so just distribute it evenly. Rinse thoroughly. Drying: Never blow dry your hair on the highest setting. Excessive heat will dry out the hair and make it appear dull. Caring: Never use products containing alcohol or ethanol, and when using special care products like styling products, conditioners or treatment products containing silicones or oil, use only on mid-length or ends. Sleeping: Loosely tie your hair in a ponytail or loose braid before going to bed. Never go to bed with your hair wet or wrap your head in a towel for long periods of time. Can I perm my hair and can I use styling products? You may perm your hair but harsh chemicals could cause stress on the extensions. You could use most styling products. We recommend keeping emollient /oil based products from where the extensions is attached. Oil could loosen and cause the extensions to slip. Products with high alcohol content may dry out the extensions. Can extensions be styled as your own hair? Yes! Hair extensions may be styled as you wish as they are 100% human hair. We suggest you consult our extensions specialist. 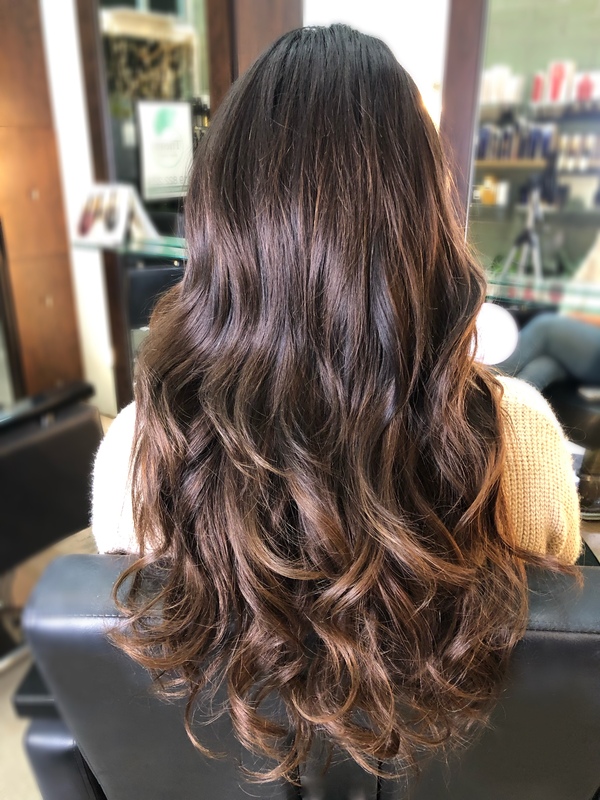 Our Hair Extensions may be lightened up to 9% H2O2: however, we do not recommend this to be done on tonalities from black to brown or from dark brown to blond. Subtle changes may be slightly modified but the more drastic the colors, the more you will discover inconsistencies of the outcome. How many possible color variations exist? With over 50 preset colors, our trusted vendors offer a wide range of colors and if this is not enough the strands may be custom colored for each individual client. Why do our hair extensions colors last so long? Hair extensions color tends to last a lot longer because of the osmosis process. The pigment is removed from the hair without destroying it and before recoloring. Hair is not porous and this makes the color last longer. Do you see the bonds? The bonds are small and flat. The “Locs” Extension method are small and being individuals, it is virtually undetectable. The Invisible/Tape Extensions method usually lays a bit flatter and closer to the scalp. Both methods are perceivable only when you pass your hands through your hair. Our extensions specialist will work closely with you to customize the perfect placement to achieve an ideal look while considering your lifestyle. How do hair extensions respond to water activities? Apply conditioner thoroughly to the extensions then braid or secure the hair in a ponytail and you are free to enjoy your activities. Rinse hair out, shampoo and condition as normal after water activities are complete. Please keep hair away from chlorine. Our hair extensions will last you about one year of wear with proper recommended at home care and styling. Please request an in person consultation so our hair extensions specialist could better customize your desired look. Ideally, starting at chin length as the shortest length for simple blending and everyday styling.